The Right of Public Access is a unique opportunity to move freely throughout the Swedish countryside. But along with rights come responsibilities. Consideration and care must be given to nature and wildlife, to landowners and the others with whom you share the Swedish countryside. The 1,200-kilometre Skåneleden Trail crosses through forests, pastures and beaches. If you are hiking along the Skåneleden Trail, it is important to keep in mind that you are travelling over someone else’s land. Some 1,000 landowners have generously made their lands available for hiking. Close gates behind you and do not cross into or over anyone else’s property. Do not cross or enter areas where reforestation or cultivation is underway, and be aware that the Right of Public Access is limited in nature reserves and national parks. You will find the rules posted on information boards in these areas. You can also contact municipal or county administrations for more information. As a guest enjoying the Swedish countryside, it is always up to you to find out what the rules are in the areas you visit. You will find more information on the Right of Public Access here. Camping under the night skies in fresh air is a wonderful experience. According to the Right of Public Access, you can pitch your tent in the countryside for one night before you have to move to a new place. If you are part of a larger group with many tents, you must have the landowner’s permission. Keep in mind that you may not disturb or intrude upon the landowner or damage nature in any way. Choose hardy ground to pitch your tent, and do not camp on land used for grazing or any type of agriculture or cultivation. Your campsite must be located well away from people’s houses. 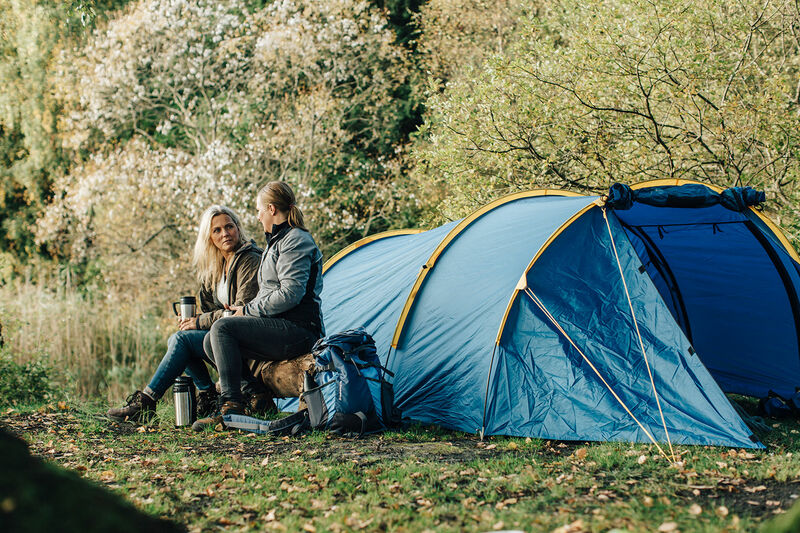 In national parks and nature reserves, special regulations for camping may apply. Once you’ve settled in, a campfire can add to the outdoor ambience. You may light a fire in nature as long as there is no ban on open fires. Bans on open fires are especially common during the summers when it can be dry. Please check out the updated trail status applied to each section on this website to know if there is a ban on open fires. Remember that you are personally responsible for the fire and can be held liable for any fire damage. Whenever possible, use the purpose-built grill areas, or reduce the risk of your fire getting out of control by preparing a temporary grill area on an appropriate surface. Always extinguish your fire or the embers with water, and remove any custom-built grills before you continue on your way. Fresh fish is extra delicious when you’ve been hiking. But fishing is not allowed everywhere. Fishing with hand-held equipment is normally permitted along the seashore. For all other waters in Skåne, you will need a fishing license. Read more about fishing in South Sweden here. In most places it’s okay to pick berries, wild flowers, herbs, mushrooms or cones from evergreens, please be aware that these thing can differ in a national park, nature reserve or on privately owned land. Always read the signs and keep yourself updated what is allowed in the area that you are located. However, you may not harvest living trees or remove any parts from them, including twigs, branches, bark (inner and outer), leaves, acorns, nuts and resin. This means you cannot cut down trees for firewood or to build a shelter. Our civilisation produces a great quantities of rubbish and this is true even when we are out hiking. Arriving at a place of natural beauty, only to find that others have literally trashed the view by littering, is upsetting to say the least. Please keep this in mind as you travel through the countryside. Do not litter - always carry your rubbish out with you until you can dispose of it appropriately. Not only will you preserve and protect the experience of others, you will also help to keep wildlife safe from injury. Our campsites are usually equipped with rubbish bins. Dogs are wonderful companions when you are out walking. But remember that those you share the trail with may be frightened by dogs running loose. Dogs can also inflict a lot of stress on wildlife and grazing animals. Please exercise consideration and keep your dog on a leash. In nature reserves and national parks, keeping your dog on a leash is mandatory. Between March 1 and August 20, all dogs must be on a leash at all times and in all parts of Sweden. This is to protect wild creatures when they are most vulnerable, i.e. during the birthing or hatching season. Hiking the Skåneleden Trail is a fantastic experience. It’s only natural to want to share the experience with family and friends. Remember that The Right of Public Access allows for individuals to move freely across privately-owned land. If you are travelling in a group, it is extra important to be considerate. Camping in larger groups always requires the landowner’s permission. Keep noise levels low so that future hikers will be as welcome as you are. Imagine that you live in Skåne and you own a piece of land. You feel a strong sense of pride in Skåne’s beautiful countryside and you want as many people as possible to enjoy it. That’s why you give your permission to the municipality to allow the Skåneleden Trail to pass through your lands. But one day you find garbage in your meadow. Someone has also knocked down the markers in several places and failed to close the gate that keeps your sheep and cattle safely enclosed. It’s a real disappointment. And you regret your generosity. To offer an attractive trail, we must leave the countryside we pass through in the same good condition in which we found it. Do not disturb - do not destroy. After many days of hiking, your feet might be feeling a bit tender and your senses may be longing for change. Perhaps you’d like to test cycling or horseback riding in the countryside. The Skåneleden Trail is a hiking trail and landowners have agreed that their lands can be used for the purpose of hiking. Thus we do not recommend cycling or riding horses on the Skåneleden Trail. We refer you instead to trails designed especially for cycling and riding horses. Off-road driving of any type of motorised vehicle is always prohibited.